One moment my Mac can QL my camera raw files (NEF and CRW) and the next it cannot, just producing a grey area on the screen. Did a whole lot of googling to see whats going on. Didn't find anything other than suggestion to re-install the current update (10.6.8). A restart seemed a less time consuming option first, which happily fixed the problem. whomwah.github.com/qlstephen to read the suffix-less README, INSTALL and CHANGELOG files you get with downloaded source code and some apps. For more free ones take a look here. When you've installed the QL plugin, you may need to force a refresh of the QL databse. generates a preview. Handy to see if QL has the right plugin. 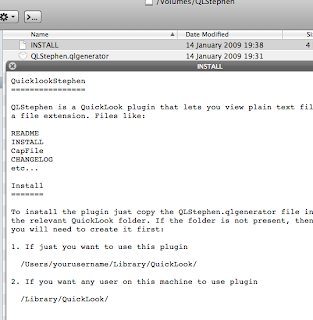 qlmanage allows you to test your Quick Look generators and manage Quick Look Server. 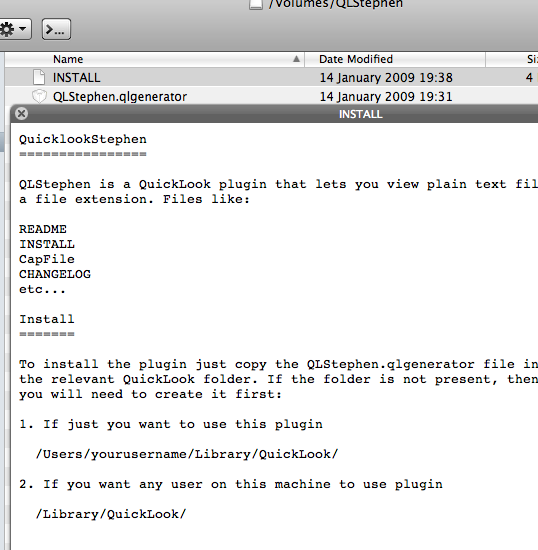 1. qlmanage -r resets Quick Look Server and all Quick Look client's generator cache. 2. qlmanage -m gets all sort of information on Quick Look server including the list of detected generators. 3. qlmanage -t displays the Quick Look generated thumbnails (if available) for the specified files. 4. qlmanage -p displays the Quick Look generated previews for the specified files. 5. qlmanage -h displays extensive help.